Span – 25 ft. 8 in. Chord – 4 ft. 6 in. Length – 17 ft. 5 in. Empty Weight – 500 lbs. Useful Load – 300 lbs. Gross Weight – 800 lbs. Fuel Capacity – 15 gals. 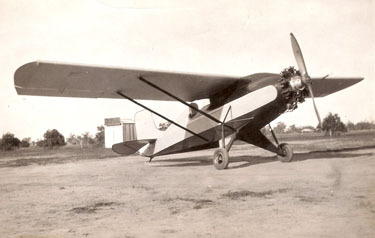 1930 - Mr. Corben designs and builds the Junior Ace--a two-place version of the Baby Ace. This aircraft kit cost $1,374 assembled and $549 unassembled, less engine. 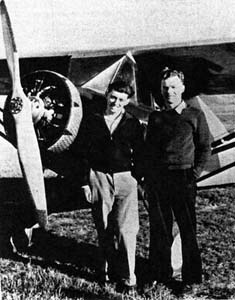 1930 - Mr. Corben starts the Corben Sport Plane and Supply Company in Peru, IN. The company produces one factory-built Junior Ace. 1930 - The US government places severe restrictions on the certification of homebuilt aircraft causing Mr. Corben to stop offering his Ace plans. Span (open) – 25 ft. 4 in. Span (closed) – 27 ft. 8 in. Empty Weight (open) – 400 lbs. Empty Weight (closed) – 475 lbs. Height – 6 ft. 6 in. Empty Weight – 520 lbs. Useful Load – 400 lbs. 1934 - The Aeronautics Branch is renamed the Bureau of Air Commerce. October 1, 1934 – Aeronautics Bulletin 7A is amended by the Civil Aeronautics Board. 1934 - Mr. Corben designs the single-place Super Ace sport plane. November 1, 1937 - The Bureau of Air Commerce publishes Civil Air Regulation CAR Part 04-Airplane Airworthiness which supersedes Aeronautical Bulletin 7A. Design type certificates and production certificates are now issued separately. As a result of this new regulation, all holders of Approved Type Certificates, such as Corben, are sent letters from the Bureau of Air Commerce offering to convert their Approved Type Certificates to the new Type Certificate. Approved Type Certificates that are not converted to the new Type Certificate will be expired. 1938 - The Civil Aeronautics Act transfers federal responsibilities for non-military aviation from the Bureau of Air Commerce to a new independent agency called the Civil Aeronautics Authority (CAA). May 15, 1939 - Aircraft Owners and Pilots Association (AOPA) is founded.